Raccoons can be a major pest in the vegetable garden. They have front paws that resemble human hands and are able to raid gardens in the evening while you are asleep. Raccoons like to eat most vegetables including squash, tomatoes, corn and melons. 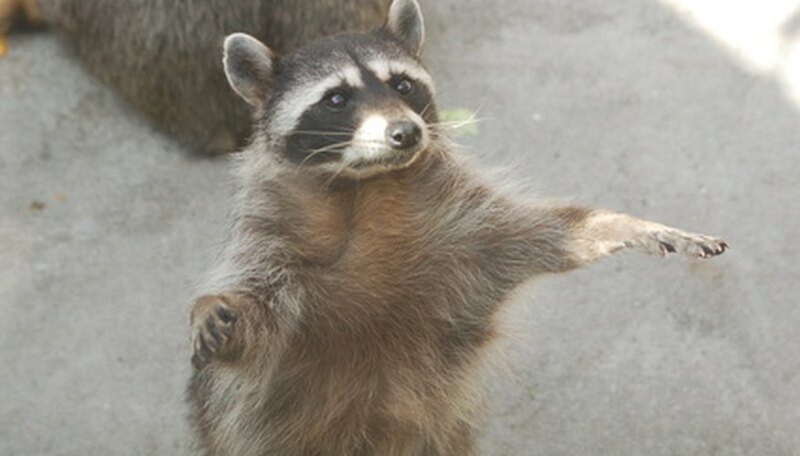 Also, raccoons carry parasites and other diseases such as rabies. If you are bothered by raccoons, your only choice is to fence them out of the garden with an electric fence. Clear vegetation from area where the electric wires to repel the raccoons are going to be located. Any vegetation touching the wires will create a short in the electric current running through the wires. Place posts every 6 feet around the garden where the electric fence will be located. Because the height of the fence is going to be only 12 inches high, you may not need a gate section because you can easily stop over it. Keep pets and small children away from the fence. Attach insulators that will hold the electrical wire to the posts. The insulators hold the wire away from the posts so it cannot be shorted out by the fence posts. On each post, place one insulator 2 inches from the ground, one 6 inches from the ground and one 12 inches from the ground. Run the electric wire through all the insulators as needed with each end of the wire attached to the generator. Run the wire so there is a continuous current throughout the wire, so there are no breaks in the wire. For example, after the wire for the 2-inch level is run, simply run the wire up to the next level and begin running the wire into the 6-inch level of insulators. Follow the instructions on the generator that tells you how to make the generator work properly and where to connect the wires. All generators or regulators are slightly different, but there will be a place for the positive and one for the negative connection. You will usually be required to ground the electric current for optimal performance. If using a battery operated system, check the system often to see if batteries are working properly. Keep vegetation away from electrical fence lines so the system cannot short out and fail when the vegetation touches the wire. A live trap is an alternative method for control. Move them at least 5 miles or more away so they will not come back. Also, get permission from the landowner where you are releasing the raccoon. Use only a system that includes a generator and regulator designed specifically for electrical fencing around a garden. A system designed for a garden includes a regulator that prevents a continuous current that can be dangerous. Do not connect directly to household electrical current.